Grill and slice chicken. Boil macaroni as directed. 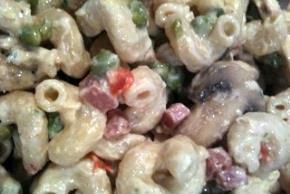 While macaroni is boiling, sautee butter, tomato, mushrooms, ham and peas. Begin preparing included Alfredo cheese sauce - add additional milk to thin sauce out a bit so it will coat add ins. Add sauteed ingredients and serve.